As a parent, you can often stare and wonder what your little one wants to be when they grow up. You might ask them when they’re 4 and that will change 100 times by the time they are 10! Well, if only for a few months, your little boy or girl can be JUST what they want to be, now. 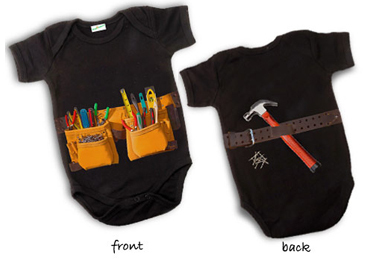 TinyTinkers shirts gives your child freedom to be a baker, cowboy, gardner and many other things, with simply adorable shirts. Brainchild of noted Los Angeles photographer Orly Catz, the shirts are eco-friendly and come in 16 different colors/designs. Just looking at them makes you dream BIG for your child. Why put off what they could be TOMORROW and let them play today!